It was 1945 in Moscow. World War II was finally over, and the German prisoners of war had just been released. Russian soldiers were marching them through the streets to the Moscow train station. There they would be loaded into box cars and taken back to Germany. The people of the city of Moscow lined the streets, and they were angry. They were filled with an intense hatred that could in a moment erupt into violence. Hitler’s decision to double-cross Stalin and invade Russia devastated that nation. Forty million Russian soldiers and civilians died in World War II. That is almost 100 times the number of Americans that died in the war. Every family in Moscow lost someone, many families lost several loved ones. And these German soldiers caused the death and destruction. The first German soldiers to go by were the officers. They were a proud and arrogant group. They had buttoned their uniform jackets to the top and marched proudly in line as if they were on parade before their own generals. They did everything they could to give the impression that prison had not broken their spirits. They wanted people to know that they were not defeated and had no regrets. Some walked by with smirks on their faces and they looked defiantly into the angry crowd. The crowd was livid, and was shouting, spitting, and pushing their way forward. The police had all they could do to stop a riot from breaking out. Then, the crowd quieted down a bit, and soon they were silent. The officers were past, and now it was the enlisted men that were going by. These were the foot soldiers. They had apparently been kept in a different part of the prison, because they weren’t buttoned up and marching proudly. They were just barely moving along. They were in rags, and looked starved, sick, beaten. Some looked near death. Nobody felt like shouting at them or spitting on them. A Russian woman quietly walked past the police and gave one of the soldiers a piece of bread. A few others did the same. All remained quiet. Suddenly, those men weren’t the enemy anymore, but they were someone’s loved ones: someone’s little boy, far away from home, sick and dying; someone’s big brother who they hadn’t heard from for a while; someone’s husband who was feared dead; someone’s fiancé; someone’s daddy. 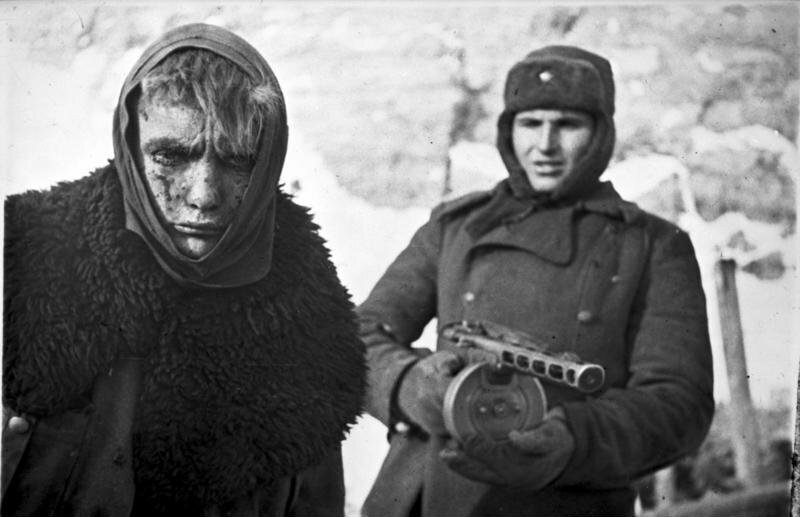 Many of those Moscow Russians had no doubt seen their own boys come home from the front looking ragged and sick and beaten just like those German boys, and they had pity on them. The whole crowd changed from hatred to pity in a matter of minutes; and the change came from looking at other people in a different way, from gaining an entirely different perspective. Jesus is always teaching us to look at people, and all of life, from a different perspective. Do you remember what Jesus had to say about enemies? Jesus said, “You have heard that you should love your neighbor and hate your enemy, but I tell you love your enemies, and pray for those who persecute you… If all you do is love those who love you, what reward will you get? Even the pagans can do that much.” Jesus calls on us to look at other people in a different way. In fact, Jesus calls on us to look at everything in new and different ways. This other way of looking at things is made possible by Christ’s resurrection from the dead. In the third chapter of Colossians Paul says, “Since you have been raised with Christ, set your hearts on things above, where Christ is seated at the right hand of God;” and not only your hearts, but also, “Set your minds on things above, and not on earthly things.” Set your hearts– your emotional life; and you minds– your thinking and reasoning, on things above. Above what? Above the earth, so that you are able to see things as God above would see them. Then we may understand and approach everything not only from within the limits of this life, but in light of eternity, because we, like Christ, will be raised. That changes everything. Those German soldiers were not only the enemy, but they also were children of God; children badly misled, and guilty of the most terrible things, but still his children and able to receive his forgiveness. God is the heavenly Father of both Russians and Germans. Everyone you meet, friend or enemy, is a child of God with eternal dignity and worth. Colossians 3:1-2 — Since, then, you have been raised with Christ, set your hearts on things above, where Christ is, seated at the right hand of God. Set your minds on things above, not on earthly things. Philippians 2:1-4 — Therefore if you have any encouragement from being united with Christ, if any comfort from his love, if any common sharing in the Spirit, if any tenderness and compassion, then make my joy complete by being like-minded, having the same love, being one in spirit and of one mind. Do nothing out of selfish ambition or vain conceit. Rather, in humility value others above yourselves, not looking to your own interests but each of you to the interests of the others. Grant, O Lord, that we may keep a constant guard on our thoughts and emotions, that they may never lead us into sin; and that we may live in perfect love with all people– in affection to those who love us, and in forgiveness to those who hate us. Give us good and virtuous friends. In the name of Jesus. Amen. This entry was tagged perspective. Bookmark the permalink.